Ikea is shaking up the Swedish meatball. The furniture giant is rolling out a new version -- called grönsaksbullar -- that is made only of vegetables, and contains a favorite of hipsters everywhere: kale. The dish will be available at almost all Ikea restaurants starting today, April 9, for $4.49, which will include 10 of the vegetarian meatballs, the company said in a statement. The furniture giant is turning to a vegetarian option partly to boost sales at its restaurants, Michael La Cour, managing director of IKEA's food business, told The Wall Street Journal. Its food unit sold almost $1.5 billion in sales last year, or 5 percent of the company's total revenue, by serving more than 600 million customers who top off a visit to the massive stores with a bit of Swedish-style nosh, such as heart-shaped Swedish waffles. "The veggie ball is meant to cater to a wider audience and offer more choice," La Cour told the publication. "Our prime ambition is to drive visitation to stores." About 5 percent of Americans self-identified as vegetarian, according to a 2012 Gallup poll. While that's largely unchanged from the previous decade, more Americans are eschewing red meat in favor of leaner options such as chicken or vegetarian entrees. Ikea may also be aiming at a particular demographic with the new vegetarian dish: Gallup found that 7 percent of women are vegetarian, or three percentage points higher than men. Women are also more likely to make the buying decision on major household items such as furniture, according to Nielsen. Given those trends, Ikea may be looking to appeal to a sizable group of shoppers who want a meat-free option after roaming the store's huge display floor. The market for vegetarian-friendly food is also booming, with the meat-free market reaching $969 million in sales last year, according to the research firm Mintel. In 2013, more than one out of every 10 new food or drink products included a vegetarian claim, it found. 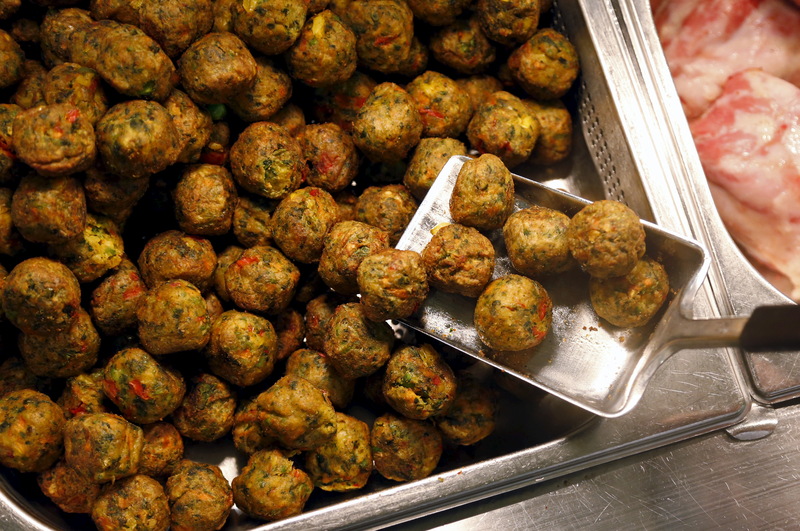 The Swedish company said it has another reason for the veggie balls: they're more sustainable and earth-friendly than meat. The new dish has a lower carbon footprint, and fits into the company's "people and planet positive strategy," it added. Other changes are also coming to Ikea, with the corporation planning to update the restaurants in its fiscal year 2016 to make them more "homey," as well as an increased focus on animal welfare. By the end of the 2015 fiscal year, Ikea said most of its seafood will be ASC or MSC certified, which indicates environmentally sustainable fishing. Ikea will also start selling frozen yogurt and flavored water, The Journal added. In a statement, LaCour said, "We have high ambitions, and our journey in this direction has just begun. I am proud that we now take the first step and start serving veggie balls."